I’m happy to say that it will premiere at the Tribeca Film Festival on April 19th. Man! I appreciate everyone who helped to make this dream come true! Big Prez (my nickname for God) has smiled on me, again. If you ever want to see a blessed, bald-headed, greasy old fart, just look my way. There are no words to tell you how much I appreciate all of you for being in my corner and paying for the care that I need at home. I’m always thinking of you! None of this would have been possible without your love. Thank You!!! And I’ve got to thank all of my friends who worked so hard to honor my love for mentoring with such a beautiful film like “Keep On Keepin’ On.” So many dear friends to thank. Many of them are my students! Click here for more info. I am very humbled, and very grateful. My dear friend, Quincy Jones organized the whole music scene. It really touched my heart that Quincy, Dianne, Herbie, Roy, Esperanza, and Justin are planning to do all of that for me. It is so beautiful, and I feel so blessed! Man, I wish I could be there! Josh Pesmen is one of my newest students. 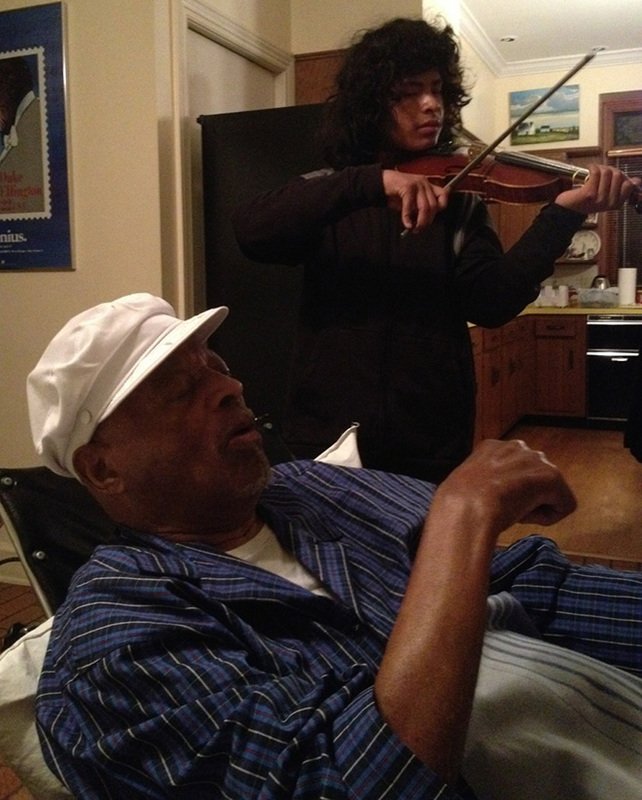 A real promising violinist and guitarist. I worked with him on ear training. Both of us had our eyes closed. We had a blast! He’s going to the film premiere, too. All of this good news about the film is very welcome, because it’s been almost four months since my last blog. Reason being, after my birthday on December 14th, I was hit with some pretty strong uppercuts and jabs health-wise. Back pain, chest congestions, Laryngitis, and some other oddities. Even had to reschedule lessons with my students. Through all of those stormy days, I did my best to hang in there. You can’t imagine how much you’ve lifted my spirit and encouraged me to stay involved on the scene. That’s my friend Bob Lanese with me. We were playing a game where I was pretending to finger my horn valves on his lower arm, and he had to guess the tunes. He guessed them all! Bob is a dear friend, and a great trumpet player. I was speechless when he told me that he and some beautiful friends in Hamburg had put on a fundraiser for me in January! Dozens of cats, man! 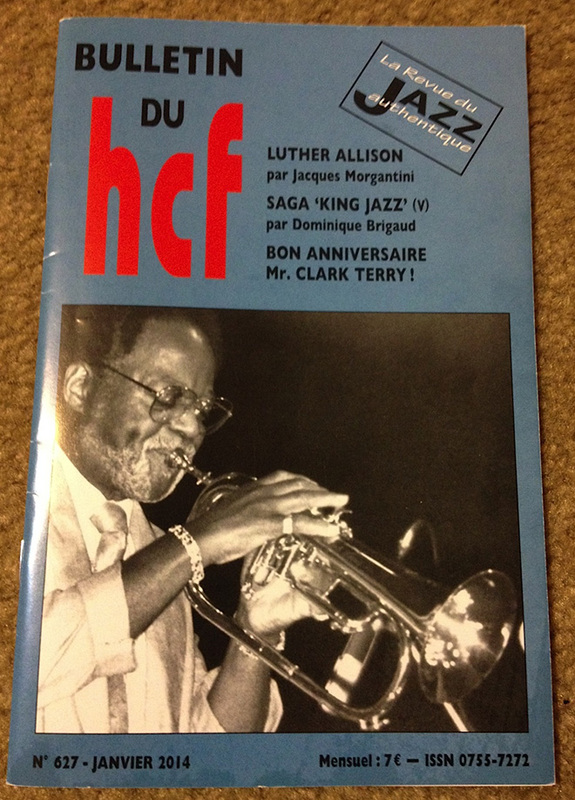 They put their donations into my Clark Terry Fund at the Jazz Foundation of America. Can you imagine how that made me feel? All I could do was shake my head, and thank Big Prez for so many blessings. I was very happy that Bob came to visit me. And I asked him to tell everyone over there in Hamburg that I appreciate what they did more than they will ever know! 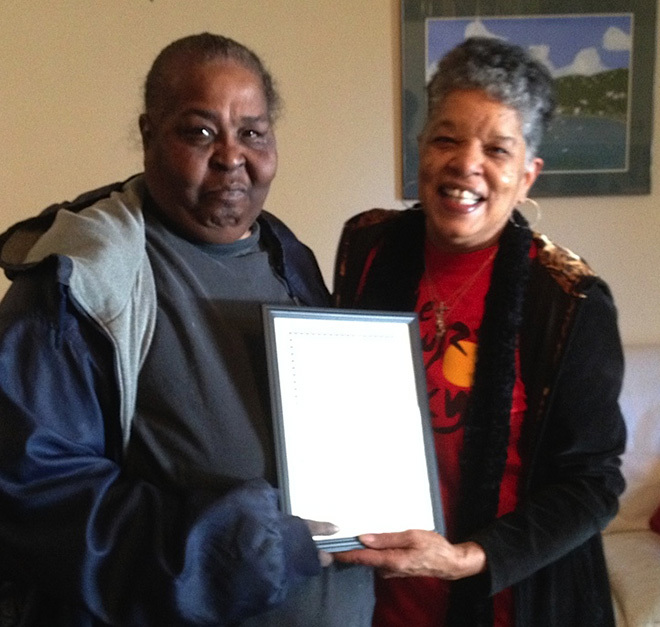 Gwen and I presented my Health Aides with Certificates of Appreciation. They take excellent care of me, and I thank Big Prez for them! Marilyn Turner was detained with car trouble, but she made it! Thank you, again, for helping me to have such great 24-hour-care. My health aides have been lifesavers. Encouraging me and doing their best to cover all of my needs. Even though it gets rough for me sometimes, I’ve always believed that you just can’t throw in the towel. No matter what! If there’s the slightest chance for victory, then we’ve got to aim for it. I’ve had days when health problems knocked me down. But I kept praying and trying with all my strength to get back up. I’d lie in my bed and lift my arms up and over my head a hundred times a day. Do whatever I could to move that circulation. I’ve kept on fighting back because there is no other choice. When I realized that Old Arthur (Arthritis) was causing problems with my hands and squashing my attempts to get back into playing my horns, I did the next best thing to fight back. I kept my iPod going 24/7. There’s magic in that music! It kept my mind off my troubles, and focused on positive vibes. 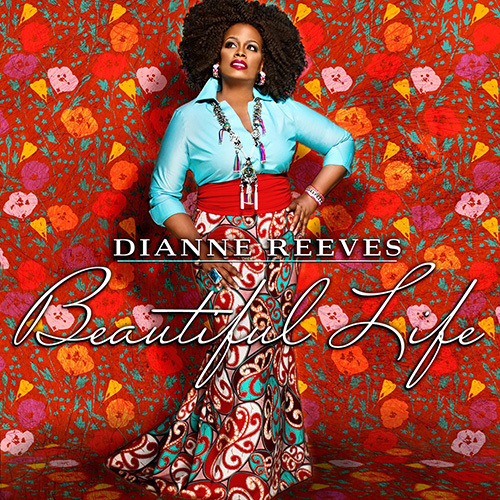 Dianne Reeves called me on the phone and said she had a little time off. Said she wanted to visit me. I couldn’t wait to see her, and thank her in person for planning to sing after the film premiere at Tribeca. She came and hung out with me, and it was a gas! We shot the breeze, and then we listened to her newest CD. I’m so proud of Dianne, and I was happy to find out that Terri Lyne Carrington produced this CD! Two Grammy-winning ladies. I love both of them! 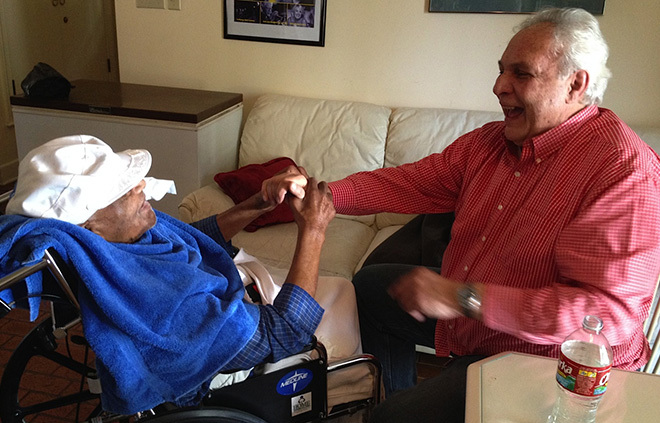 Before I end this blog, I’ve got to tell you how much I appreciate that swinging 93rd birthday party last December. That was one of the best parties I’ve ever had! Live music from some of my students at the University of Arkansas at Monticello. And, man, friends came from near and far. I had so many calls until I went to sleep with the phone in my hand. Partied until 4 o’clock in the morning! I hung in there the best I could in my wheelchair, on the couch, and in my bed. Wore me out! But I really had fun, and everybody said they did, too. Everybody said that my cake was really tasty. And that hand-blown glass trumpet was a gift from my beautiful friends, Robert and Sophia Phillipson. They came all the way from Holland to my party. We had a great time! To each and every one of you who sent me beautiful birthday cards, gifts, emails, and posts on my site, I hope you know that you made this old man very happy. Believe me, I’ll remember that birthday forever! 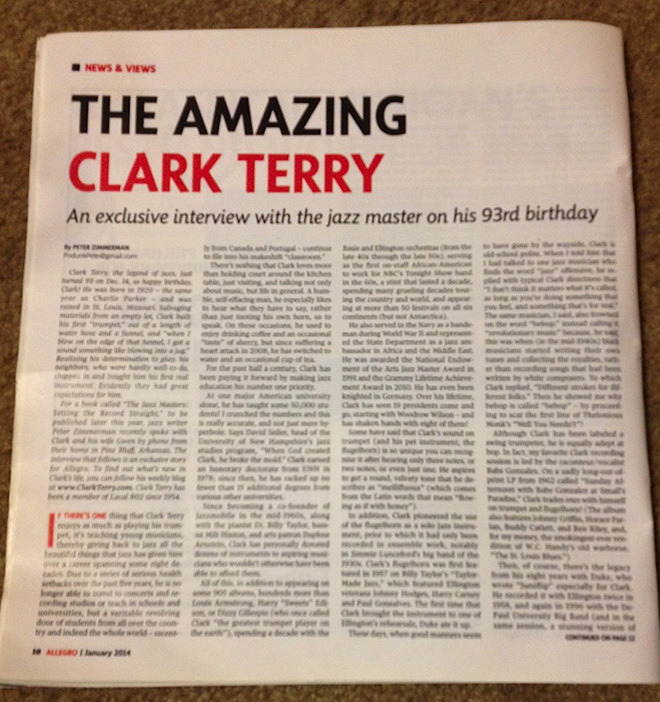 I’ve also got to thank Francois Desbrosses, Dominique Brigaud, Tina Vartanian and all of my friends at Hot Club de France, Bulletin du hcf, for that great birthday write-up – “Bon Anniversaire Mr. Clark Terry!” It meant a whole lot to me! What a hip surprise. Thank you for not forgetting about me. Gwen read this beautiful article to me, with the help of Tina’s translation (Thanks a million, Tina!). I enjoyed it vey much. I was happy to know that my European friends were thinking about me, and still enjoying my music. I send my love to all of them! Everyone who read this article had high praises about it. Peter, man, I enjoyed working with you. You did a great job! Hats off and much love to all of My Allegro friends. I’m dedicating this blog to my very dear friends who passed away last year. I miss them so much. They are still in our hearts, and will never be forgotten – Donald Byrd, Mike Canterino, George Duke, Herb Geller, Chico Hamilton, Yusef Lateef, Marian McPartland, Mulgrew Miller, Claude Nobs, Phil Ramone, Ed Shaughnessy, Cedar Walton, Frank Wess, and Jennie Wilkins. I will always love you! And to all of you who are still on this side of the grass with me, I want you to know that I appreciate everything that you have done and are doing for me. I thank Big Prez for all of your kindness and encouragement every single day. I love you with all of my heart. Let’s keep praying for each other, and keep on keepin’ on! 15 Responses to Always Thinking Of You! Clark, I want to thank you for sharing your story, your passion and your art with the world. My husband and I had the good fortune to see your film at the Hot Docs festival in Toronto and it was 80 mins of pure inspiration. Every single person in that theatre walked out that evening with their hearts filled with love and possibilities. Thank you. Clark, God love you for being such an inspiration. Any time I am having a rough day, or if I have a few aches and pains from Old Arthur, I just think of you and thank God that we are alive and able to feel the pain. I am so glad you had such a wonderful Birthday. I am looking forward to the movie. I had the pleasure of donating to the making of the film. Thank you for being you! Love and prayers coming your way! Do you have this documentary on youtube or online. I wanna buy/rent maybe from iTunes. Now I play trumpet in Thailand. Hope to see “Keep on Keepin on” at US. Just to let you know that you have such a large following in South Africa, we still support your music, wishing you good health and many happy returns. I’m so glad you’re still hanging in there, CT! Playing with you and hanging out with you has been some of the best times of my life. Much love from me and Aileen. Happy b-day Clark. It has always been such a joy to listen to you music, see your smile! I love the times when Pete & I got to talk with you; especially the times when you played together!! My prayers are with you & yours! Much love! I think of you so often & post your tunes from YouTube! Love your blog!! thank you so much for this wonderful and enthusiastic blog after such a long time. It’s a guess! There is no single day on which I don’t keep you in my mind and listen to your music. I would like so very much to add something to your health fund but I unfortunately can’t afford it after some problems of my own in the last years. So the only things I can give to you are my everlasting love and my prayers. And you’re so right: There is magic in that music! I hope that there will be a possibility to watch the documentary film pretty soon over here in Germany, too – I can’t await it! 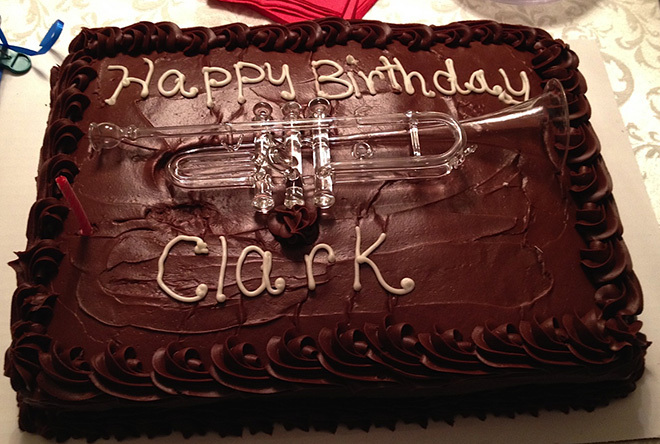 Clark – Happy Birthday! I have learned so much from you through your music. You are truly a great spirit and a beautiful being. I am eternally grateful. I’m glad that you had such a wonderful birthday celebration. You’ve inspired me since I heard you on the Tonight Show in the ’60’s, then a live concert at UNI in Iowa, and later in Chicago. I studied with Leon Merian in Florida and he always expressed nothing but love, warmth and respect for you. I think you even interrupted a few of my lessons, which was a thrill for me. One of my all time favorite musicians. Also, your nephew and I have been close friends since high school. We used to play chess at your sister’s house, and listen to Mumbles. CT Hope you have a happy BD. I am always in your debt for all the great memories and lessons that you gave to me in Flint. God bless.